Preheat oven to 375 degrees F (190 degrees C). Butter a medium baking dish with 1 tablespoon butter. Melt 1 tablespoon butter in a skillet over medium-low heat. Stir in the onion, celery, and garlic, and cook 5 minutes, until tender. Increase heat to medium-high, and mix in mushrooms. Continue to cook and stir 5 minutes, or until most of the liquid has evaporated. Melt 4 tablespoons butter in a medium saucepan, and whisk in flour until smooth. Gradually whisk in milk, and continue cooking 5 minutes, until sauce is smooth and slightly thickened. Season with salt and pepper. 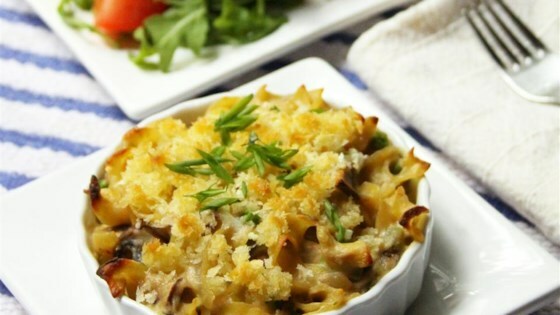 Stir in tuna, peas, mushroom mixture, and cooked noodles. Transfer to the baking dish. Melt remaining 2 tablespoons butter in a small bowl, mix with bread crumbs, and sprinkle over the casserole. Top with cheese.